"We maintain that Martinović’s conviction is politically motivated. Throughout the detention and subsequent trial, his rights to a fair trial have been frequently violated", Nora Wehofsits, Advocacy Officer of the ECPMF, said after the verdict. "Montenegro is a candidate for the EU membership and as such should comply with EU standards. It must introduce the rule of law and accountability at the highest level." 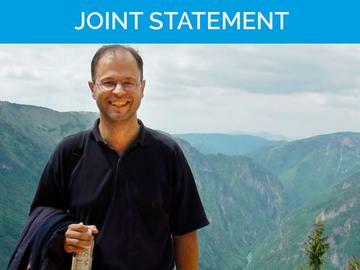 "This verdict will affect not only Jovo but other journalists in their work and further deteriorate the already bad country's record in terms of freedom of expression and media", said Milka Tadić Mijović, President of the Center for Investigative Journalism of Montenegro (CIN-CG). We demand the immediate acquittal of Jovo Martinović and call on the Court of Appeals to overturn the verdict at the second instance. All charges against him must be dropped.